Little Audrey (full name: Audrey Smith) is a fictional character, appearing in early 20th century folklore prior to her appropriation as the star in a series of Paramount Pictures' Famous Studios cartoons from 1947 to 1958. She is considered a variation of the better-known Little Lulu, devised after Paramount decided not to renew the license on the comic strip character created by Marjorie Henderson Buell (AKA: "Marge"). Despite some superficial similarities between the two characters, the Famous animators were at pains to design Audrey in contrast to Lulu, adopting an entirely different color scheme and employing the stylistic conventions common to Famous Studios' later 1940s repertoire, as opposed to Buell's individualistic rendering of Little Lulu. Veteran animator Bill Tytla was the designer of Little Audrey, reportedly inspired by his daughter Tammy (who was also his inspiration for Famous' version of Little Lulu, which he also worked on and directed several shorts with that character). The original voice of Little Lulu was performed by actress Cecil Roy (who also provided the voice of Casper the Friendly Ghost). 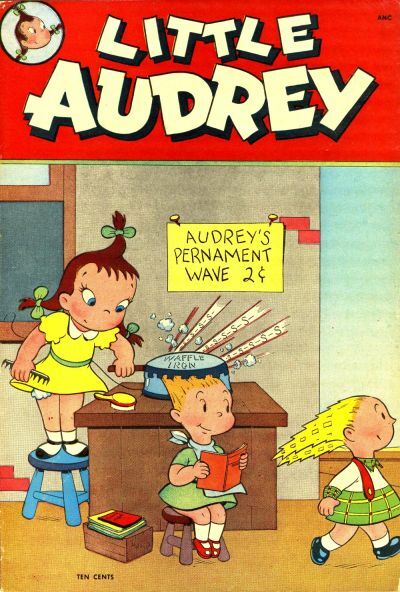 Little Audrey was instead voiced by Mae Questel, who also voiced most of Paramount's other major female cartoon characters including Betty Boop and Olive Oyl. Animation historian Jerry Beck notes that Famous Studios' animator Steve Mufatti drew a short-lived "Little Audrey" comic strip for magazines in 1951, which were syndicated by King Features. These strips were also reprinted in 1952-55 by Harvey Comics.